Three frosted, tempered glass shelves. Middle shelf is removable for easy cleaning and can be used as a serving tray. Four high-performance casters (two locking) for easy mobility. Perfect for use in conference, training and larger meeting rooms. Features a slim design with aluminum frame. 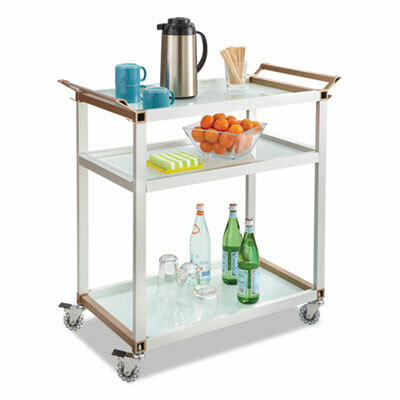 Refreshment cart features an aluminum frame and three frosted, tempered glass shelves. Middle shelf is designed to be removable for easy cleaning and can be used as a serving tray. The cart also features four high-performance casters (two locking) to ensure guests can be refreshed from one meeting to the next. The cart’s larger size is perfect for use in conference, training and larger meeting rooms. Cart holds up to 150 lbs. Material(s): Aluminum Overall Width: 35"
Overall Depth: 16 3/4" Height Maximum: 35"